The recently renovated Nørreport Station is Copenhagen’s busiest public transportation hub. Some 250,000 people pass through here every day, so you can imagine it’s a pretty hectic place. Fortunately, the perfect place to catch a break from the noise and confusion is to be found on the corner of Vendersgade and Nørrevoldgade. Here lies the Østerlandsk Thehus. 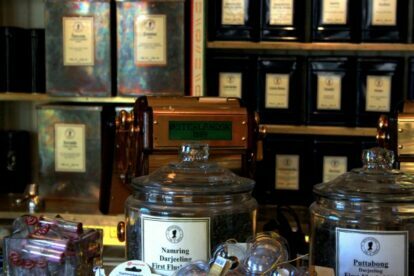 As soon as you enter through the door and breathe in the amazing aromas that permanently shroud the shop, your heart rate drops again: it’s pure medicine. Often you can enjoy a taster of a tea selected by the the well-dressed staff while waiting to be served, or you can just browse the neat selection of cups, mugs, teapots and cozies on display in the shop. The teahouse came into existence because a Danish marine had been introduced to tea by the Admiralty when he attended Queen Victoria’s 50th anniversary while aboard the frigate Valkyrie; and when he returned to Copenhagen, he opened his very own tea house, in 1889. ‘But what about me?’ the coffee lover might ask, ‘does this mean that it’s a closed party?’ No, it does not, because in addition to the world of tea, the shop also offers a wide range of coffee varieties, hosts lectures on the history of coffee, and offers cupping and barista courses. Take a couple of deep breaths, inhale the fragrance, and you’re good to face Nørreport again.